Notre « ambassadeur » aux Etats Unis, Todd Nelson, avait écrit, en son temps, cet article que nous publions aujourd’hui. In a black frame on the wall in Charles N. Shay’s tidy study, just below his Silver Star and four bronze battle stars, from World War II and the Korean War, is a tattered pink telegram. It is the War Department communiqué that his mother, Florence Shay, received in early March of 1945. Her son was missing in action near Remagen, Germany. The next time she heard from him, he was walking through her door in early May, having been liberated from a German P.O.W. camp on April 18th and sent home. Shay had been in constant combat since D-day when, as a medic with the famed Big Red One, he landed in the first wave on Omaha beach. He attributes his survival to his mother’s prayers. On Tuesday, 63 years after his heroic actions that day, Mrs. Shay’s son will become a Chevalier dans l’Ordre National de la Légion d’Honneur. 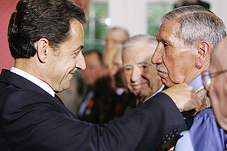 The award, which dates back to Napoleon, will be bestowed upon him and other U.S. veterans by French President Nicolas Sarkosy, while making his first state visit to the U.S. The French government has been honoring hundreds of American WWII veterans over the last several years. On June 6, 2004, a hundred American veterans were honored by President Chirac on the beaches of Normandy, marking the 60th anniversary of the D-day landing. Eighty-eight vets received the award in 2005; 200 in 2006. Shay, a Penobscot Indian who now lives on the island reservation in Old Town, Maine, has a rather unusual French ancestry of his own. He is descended from Jean Vincent d’Abbadie, the third Baron de St. Castin, a French nobleman who married the daughter of the Penobscot chief, Madockawando, in 1670. Though a highly decorated World War II and Korean War veteran, a survivor of the D-Day landing in Normandy, an ex-POW, a retired army master-sergeant, former communications officer for the Atomic Energy Commission in Europe, it is his native American heritage of which Shay is most proud. He is a Penobscot tribal elder. The next-to-youngest of nine siblings, Shay was one of four brothers to fight in World War II. The Shay brothers were drafted in 1944, along with 85 other Penobscot men and women from their 500 member reservation. Two of them served on Navy ships, one was in the Army Air Corps; Charles was a medic. They all survived the war; and Shay is the last living member of his generation. He has a somber nonchalance when describing D-Day. German obstacles thwarted a close approach to the beaches, which meant lowering the ramps and disembarking into waist-high water. Shay went in over his waist, and headed for the top of the beach to find protection from withering fire beneath the embankments—hundreds of yards from the landing zone. For gallantry in action in the vicinity of Colleville-sur-Mer, Normandy, France, 6 June 1944. Subordinating personal safety to the welfare of his comrades, Private Shay repeatedly plunged into the treacherous sea and carried critically wounded men to safety. Private Shay’s unselfish heroism exemplified the finest traditions of the Medical Detachment. “We’ve all had our individual experiences,” says Shay, “and none are more dramatic than the next.” He was just two weeks away from his twentieth birthday. “Troops” meant the Big Red One, and they went to Mons (“We pushed through Belgium in the fall…”), encircled Aachen (“We surrounded the eastern outskirts of the city and the 18th infantry regiment was on the northern outskirts. Fierce resistance”) and the Battle of the Bulge in the Ardennes (“Winter…we were pushed back…snow; very cold…lived in bunkers…a matter of survival. Then the counter offensive”). By March, Shay had crossed the Rhine. The Germans were surrounded and trying to protect their industrial base in the Ruhr valley. One day, Shay and a small reconnaissance platoon stumbled across a German tank unit idling in a village. “They got the drop on us,” he says. None of his platoon were killed or wounded, and they spent the next several weeks being moved nightly in a German “shell-game” before they arrived in a prisoner of war camp. Back home, Shay’s mother was receiving that pink telegram. “After one or two days, we woke up and the Germans were gone,” says Shay. “They took off. They knew they couldn’t move us any more. Americans liberated the camp.” It was April 18th, 1945. In days, the war in Europe would be over for everyone. After the war, Shay returned to the states briefly, but re-enlisted and went to work in Vienna, still an Army medic. He then served in Korea, and earned another bronze star for valor, followed by a 1953 stint in the Marshall Islands during Operation Castle: the atomic bomb testing program. Shay spent most of the next 45 years in Vienna, working for the Atomic Energy Commission and the United Nations commission on refugees, even drove a limo. He married an Austrian woman, Lille, and had a son, Jonny. He is now a grandfather. Eventually, he and Lille began spending summers renovating a house back on Indian Island that Shay had inherited from his aunt. They came home to retire there in June of 2003. Lille passed away that September. “Once I started coming back, I began to pick up where I left off. I became quite active in trying to preserve the history of my family,” says Shay. His time recording his war experiences for a tribal archive, and sharing his family history. The tall white teepee beside his house is a museum dedicated to Princess Watahwaso, the stage name of his aunt, Lucy Nicolar Poolaw, a widely known interpreter of Indian music and dance. He has helped to reissue a famous book by his grandfather, Joseph Nicolar, the Life and Traditions of the Red Man. Despite so many years living in Europe, Shay had never revisited his own WWII combat sites until a few weeks ago, when several grants made possible a pilgrimage to France, Belgium, and Germany. He was accompanied by Harald Prins, University Distinguished Professor of Anthropology at Kansas State University, and Bunny McBride, author and lecturer who has researched the story of the women in Shay’s family. Shay also describes his own private observance on the actual beach with a tone of reverence.